Remember that 92-mile-long bilge dump off Congo and Angola that caught our attention back in April? 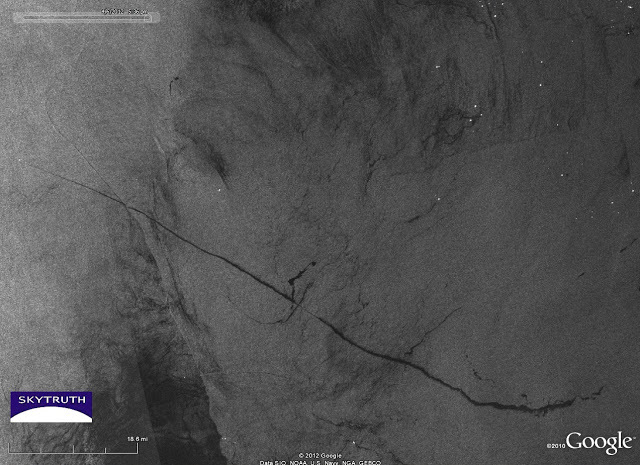 Envisat ASAR satellite radar image showing bilge-dump slick (long dark streak) off Angola on April 6, 2012. Image courtesy European Space Agency. The bright spot at the left end of the slick is likely the vessel that caused it. But the ASAR imagery left an important question unanswered: Who was responsible for this pollution? 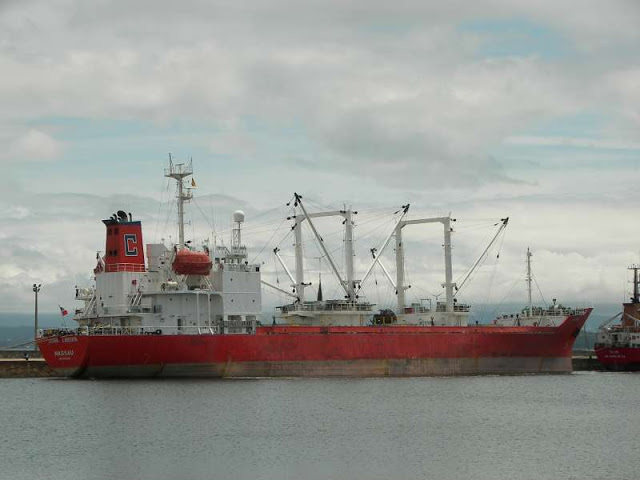 With the generous help of our new partners, SpaceQuest, new information has surfaced that helps put a name on that bright spot: the Dona Liberta, a refrigerated cargo ship owned by NaviFruit LTD. This vessel has made unfortunate news in the past. On July 4, 2011, the ship’s captain dumped two Tanzanian stowaways in Liberia’s territorial waters, strapped to empty barrels. One of the stowaways died while receiving medical treatment after washing up on shore. In November 2011 the vessel was laid up in the River Fal in England, stranding two Romanian watchmen on board in unsanitary conditions who were rescued by a charitable organization. And in February 2012, the Dona Liberta spilled 70-90 gallons of oil in the River Fal, prompting a cleanup response from local authorities. So how did we figure this out? Read all about it after the jump…. SpaceQuest builds satellites that intercept Automatic Identification System (AIS) data broadcast by vessels at sea. AIS data typically include a vessel’s identification, position, heading and speed. Vessels broadcast this information, and collect it from others, to help avoid collisions with other vessels. Insurance companies require the use of AIS by most commercial, insured vessels that are underway. SpaceQuest gave us AIS data for the region spanning a 24-hour period, enabling us to identify vessels that were operating in the area around the same time the radar image was taken. After doing some simple math, we had enough information to pinpoint the likely culprit. 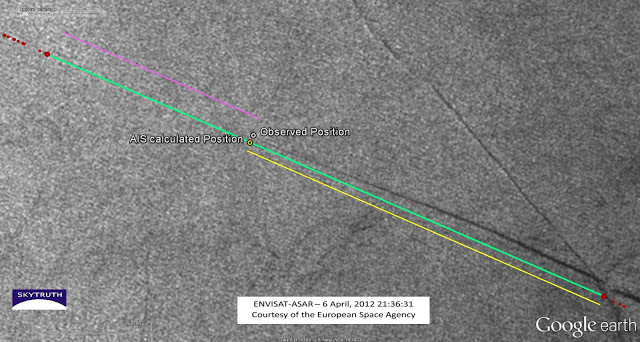 The observed location of the vessel on the radar image is labeled. 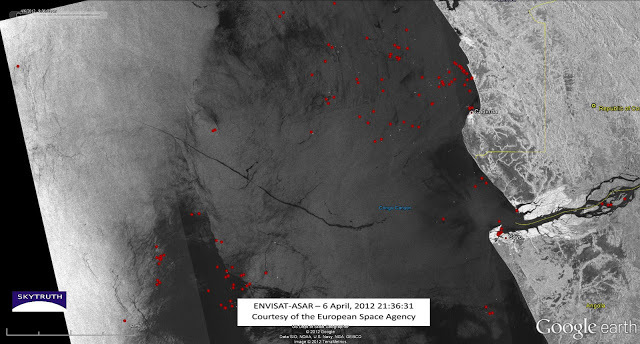 Red dots show the positions of vessels recorded by AIS data. Red dot at upper left marks the position of the Dona Liberta, 39 miles northwest of observed location of vessel. AIS data for a vessel 39 miles northwest from the observed location of the ship gave a heading of 293.8° and a speed of 15 knots (17.3 mph), and identified it as the Dona Liberta. 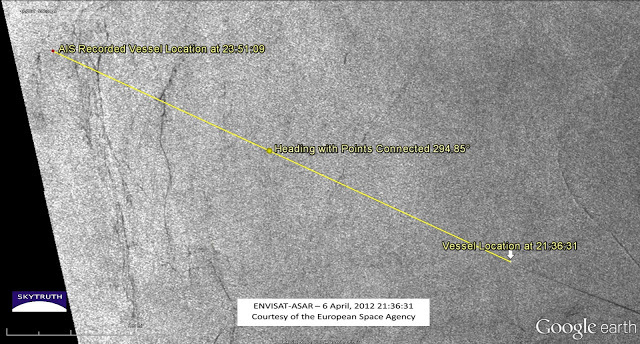 This AIS information was broadcast 2.25 hours after the radar image was taken. If the ship traveled for 2.25 hours at 17.3 mph, then the ship traveled 38.925 miles, very close to the measured distance between the observed location and the AIS position. The heading of the ship was reported by AIS to be 293.8°, only 1.1° off from the measured heading of 294.9°. 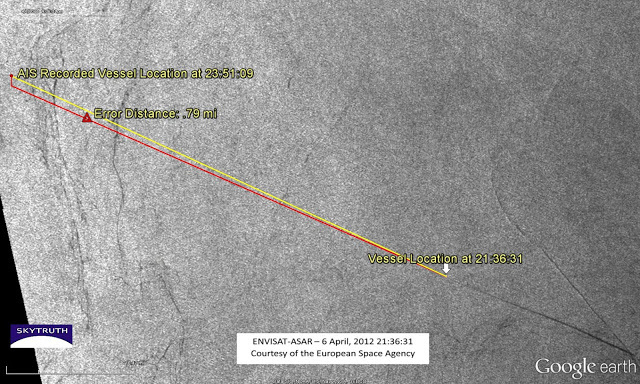 I also calculated where the vessel should be, had it been traveling for 2.25 hours at the AIS-recorded heading from the location observed on the satellite imagery. 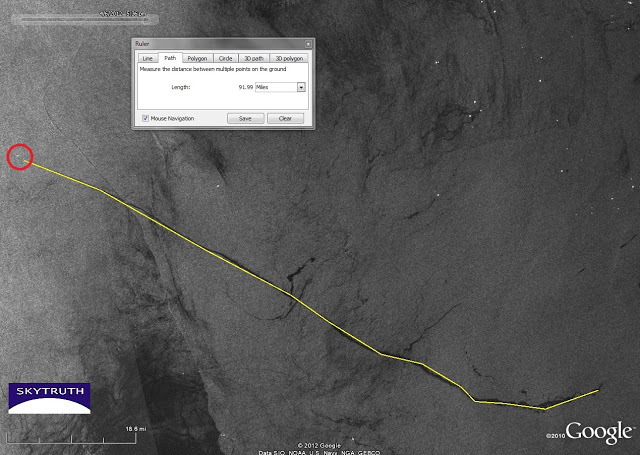 The ship would have ended up only 0.79 miles from the AIS-recorded location. No other vessels appear anywhere near this location on either the radar image, or the AIS data, making the Dona Liberta a likely culprit for this bilge dumping. Difference between AIS-recorded position of vessel and calculated position based on observed location and AIS-recorded heading and speed. Possible route of the Dona Liberta (green line) drawn by simply connecting the red dots (AIS recorded positions). The slick may have drifted southward under the influence of currents and surface wind. 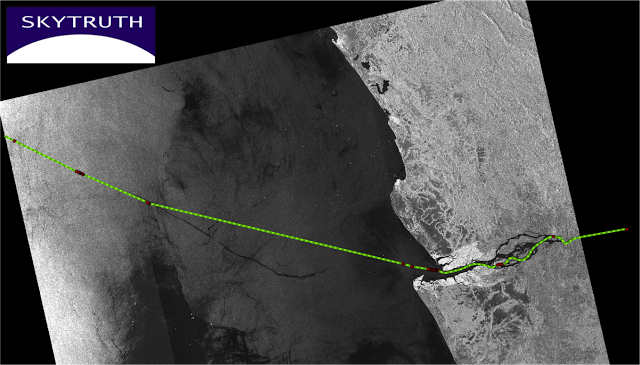 The green line connects two AIS data points that bracket the observed location of the vessel. Yellow and pink lines are distances calculated from the AIS-reported speed at both points, resulting in predicted positions for the vessel that are nearly identical to the actual observed location on the radar image. The distance between the eastern AIS position to the observed location (yellow line) is 16.9 miles, and the vessel’s speed according to AIS was 15.1knots (17.377 mph), giving a travel time of 58.4 minutes. The actual time difference between the radar image and the AIS broadcast is 54 minutes. On the other side, the distance between the western AIS point and the observed location (pink line) is 9.66 miles, with the vessel speed at 15.2 knots (17.49 mph), implying a travel time of 33.1 minutes compared with the actual time difference of 36 minutes. These measurements are not exact but are very close, with no other vessels in the vicinity that could be confused with the Dona Liberta. Bilge dumping is illegal in the United States, Europe and Canada. We don’t know what the law is governing bilge dumping off Angola. But we’re encouraged that we now have the tools to not only spot this activity, but to identify the likely offenders. And if they don’t care, maybe their insurers and clients will. dbhindin- thanks for this info! For AIS message components, the proper doc to ref is ITU-1371.4 ( http://www.itu.int/rec/R-REC-M.1371/en Page 101-102, Table 45). dbhindin is correct. True Heading is only reported in integer degrees. But don't let that in any way detract from these results!!!! It's been a long hall to get to this point. There have been a number of papers saying that this technique is possible (e.g. my http://vislab-ccom.unh.edu/~schwehr/papers/SchwehrMcGillivaryOceansMTS2007.pdf and http://dx.doi.org/10.1016/j.marpolbul.2006.11.022 ), but that is definitely not the same as actually showing it working. Thanks Kurt – the technology is maturing steadily as more AIS-receiving satellites are launched. True global coverage will be here soon. Now the regulators need to catch up!